Rigamajig - About the Designer | KaBOOM! Cas Holman first developed her imaginative approach to toy design while growing up in the foothills of the Sierras, where plentiful sticks and mud made for endless possibilities of play. She stayed in Northern California to earn a BFA in Feminist Theory and Fine Art, Sculpture from University of California at Santa Cruz, finally heading east to follow it up with a MFA in 3D Design from Cranbrook Art Academy. 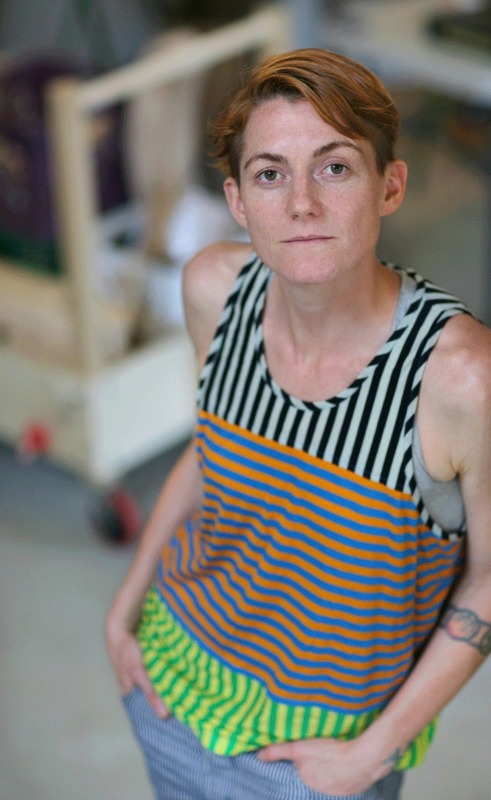 Holman is currently a Professor of Industrial Design at the Rhode Island School of Design (RISD), splitting her time between Providence and Brooklyn. She holds numerous patents, and her work has been exhibited internationally in Tokyo, Hamburg, Seoul, Moscow, Hong Kong and London. In her spare time and when her canine companions deign to allow it, Holman tinkers* in her studio, creating objects that allow our imaginations the room they need to roam. She believes that good toys make good people and, in spite of her years of advanced academia and industry accolades, she holds sticks and mud in the highest regard as toys. "Cas Holman, a professor of industrial design at RISD, was determined to give kids something more creativity-enhancing. A proponent of educational play, she came up with Rigamajig, a new, 263-piece building kit for classrooms. As kids improvise with building elaborate contraptions, or 'Rigamajigs,' from planks, wheels, pulleys, nuts, bolts, and rope, they learn about engineering, architecture, creativity, and collaboration experimentally." "In approaching this project, industrial designer Cas Holman drew on her many experiences she got from her understanding of loose play from the years of research and designing for the Imagination Playground™ (INDEX: Award 2011 Finalist) - a cutting-edge learning experiment meant to encourage imaginative, creative play with huge moveable blocks." "Emily Pinkowitz, Manager of Education, Teen, and Family Programs at Friends of the High Line summed up the result of the kit perfectly, ‘Kids who didn’t know one another are playing together; it’s exactly what we had hoped for.’ The High Line is clearly committed to innovation, because the Workyard Kit is innovative design creating community."